The Northern Lights or the aurora borealis is a beautiful and astounding natural phenomenon that has captured the imaginations of people for centuries and still continues to be one of the most sought after natural sights for travellers and explorers all around the globe. While Iceland, Greenland, Finland, Canada and Alaska are some of the more common places where people from all over the world travel to in the hopes of witnessing the aurora borealis, the UK is not totally exempt from the wondrous sight either. Almost the whole of Scotland is by far the best place to witness the aurora borealis in all its glory within the United Kingdom, but it is particularly beautiful to watch if you can get to the Scottish Highlands in Northern Scotland or even the Scottish Isles. The remoteness of these locations makes sure that artificial lighting doesn’t interfere with your view of the Northern Lights. 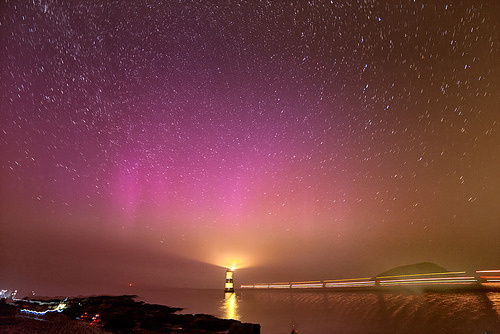 Aberdeenshire, Moray Coast, Cairngorms National Park, Galloway Forest Park, Calton Hill, Angus, coast of Fife, Shetland, Orkney and Caithness are some of the most impressive locations in Scotland to see the lights from. Even though the Northern Lights are not as prominently seen from Ireland as they are from Scotland, the Antrim coastline is an exception. The Giant’s Causeway is in itself a remarkable natural phenomenon, and it becomes an even more majestic place when the aurora borealis comes into view from atop the rock formation. If you want to take unobstructed photos of the Northern lights, this is the place where you should be heading to for that. Follow the coastline further and you will come across the Dunluce Castle ruins, another popular spot that offers an unobstructed view of the lights over the Malin sea. Try to capture the silhouette of the Demesne House and a number of other ruins along the shore, with the aurora borealis shining at their back for truly magical shots. It might be surprising for many to see England and Wales being placed on this list, but the aurora can indeed be seen from areas of lower altitude also. However, it’s a lot rarer sight since that only happens post geomagnetic events such as a particularly strong solar storm. You would have to visit the Lake District or find a location on the Derwentwater to see the Northern Lights from England. Northumberland county also offers a perfectly clear and unpolluted view of the sky, so if a solar storm is predicted, you will probably be able to see the lights from here. Other locations which have a very slight chance of hosting the phenomenon in the region include Exmoor National Park and southernmost sections of the Cornish coastline. It would be even harder to spot the lights in Wales, but Brecon Beacons and Anglesey have seen it in the past, although, more as a greenish glow than the true colours of the aurora borealis. The closer a place is to the North Pole, the better are its chances of playing host to the aurora borealis, so there are definitely places which have a better view of the lights than the UK. Nevertheless, on a good night, some of the places mentioned on this list can look absolutely mesmerising.